The government has announced a controversial new move to fight “offensive" material online. On Tuesday telecom minister Kapil Sibal said authorities would start forcing foreign Internet companies to delete material considered objectionable. He added that these firms needed to monitor this sort of material themselves. But Sibal also insisted that none of this amounted to censorship. These included statements and images that were allegedly derogatory of Congress president Sonia Gandhi. The firms included Microsoft, Youtube, Facebook, and Twitter. Sibal says these companies did not respond effectively, forcing him to take the initiative. Still, he says the government has yet to figure out what mechanism it will use to tackle offensive content online. And finally, BlackBerry Maker RIM has a new head for its Indian operations. On Tuesday the firm named Sunil Dutt its new managing director. 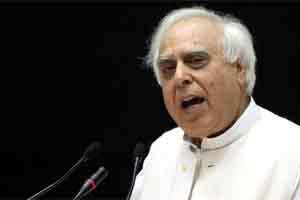 Kapil Sibal clamps down on Internet companies; Axis Bank plans new focus on retail loans; RIM has a new India head. He replaces Frenny Bawa who left RIM last month. RIM has been aggressively marketing its BlackBerry phones to non-business users in India. But it’s also struggling to win back consumer trust after widespread outages in the US.